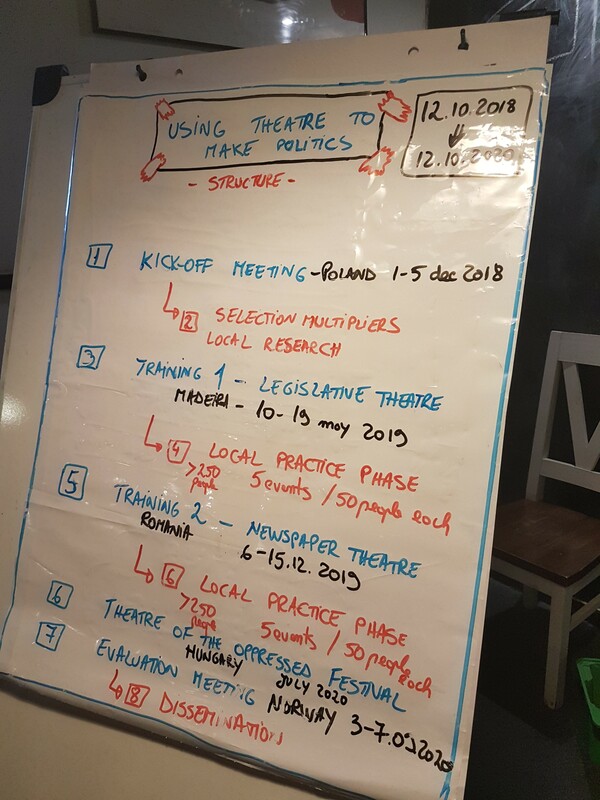 “Using Theatre to Make Politics” is a two-year project which aims to increase the capacities of six youth organisations in raising the level of civic participation and involvement of young people in various democratic and policy-making processes. This will be done through the introduction of innovative practices such as Legislative and Newspaper Theatre in the youth work field, the stimulation of exchange of best practices in working with authorities to tackle issues faced by young people, and the stimulation of the development of a network of Theatre of the Oppressed practitioners from across Europe, able to use their skills to advocate for change. Ultimately, the project will raise the capacities of partner organisations in the area of advocacy and policy making and lead to the development of strong proactive attitudes and a sense of initiative amongst both partners and beneficiaries. ➢ First practice phase in each community which will involve 5 local legislative theatre events. ➢ Second practice phase in each community which will again involve 5 local theatre of the oppressed events. ➢ The Theatre of the Oppressed Festival in Hungary in July 2020. This will be an opportunity for all national teams to come together and share all the performances developed and performed at the local level during the practice phases. ➢ Project Evaluation Meeting in Norway on 3 – 7 September 2020. ➢ Dissemination of project results in each participating country through both tools, such as a film and a manual, and local activities. ➢ Legislative Theatre is forum theatre performance about a particular social issue that ends in a crisis, which the audience is invited to help solve by taking the place of one of the characters on stage, and thus becoming “spect-actors”. This is followed by a discussion on policies or laws which could help solve some of the problems touched on in the play. In our project, the local teams of actors and multipliers will choose one social issue from their local community to create a performance on. The audiences for the five local events will consist of both people affected by the issue and decision makers able to effect change. Out of the play, proposals will be identified and used to advocate for change at local, regional or national level. ➢ Newspaper Theatre aims to open a debate on the media as an oppressor / source of manipulation or to tackle examples of oppression included in newspapers. It can take diverse forms: performances, exhibitions, dynamic installations etc. Similar to the first phase, our teams of actors and multipliers will decide on a social issue to tackle as well as the form this will take, then present it to local audiences in 5 events. Over the two-year period, 25 facilitators will be trained in using theatre of the oppressed as a tool for policy making and raising the level of active democratic participation in their communities. They will act as multipliers of information to over 40 volunteers, and together they will implement the practice phase which will reach around 3000 young people and 120 decision makers. 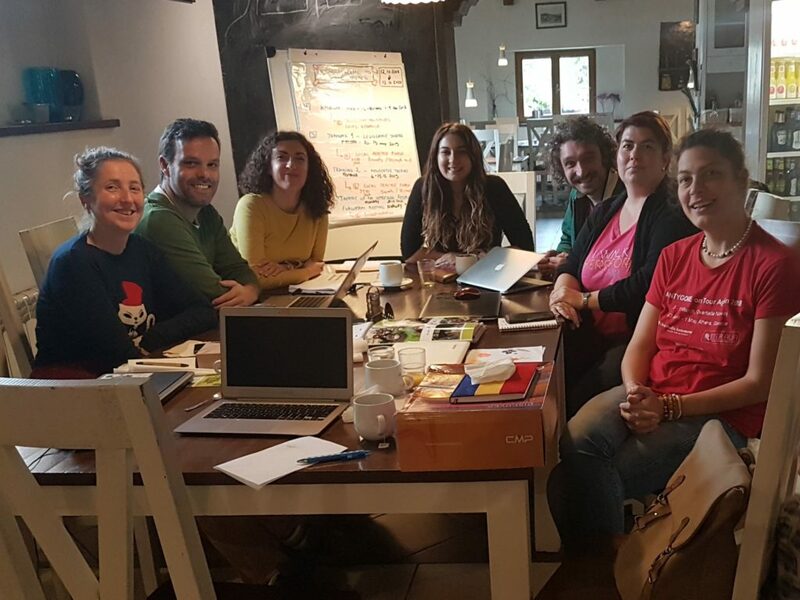 Finally, new tools and methods for the involvement of youth workers in the policy field will be developed throughout the project and included in a written manual which will be made widely available to organisations and citizens. This project has been co-funded with the support of Erasmus + Programme of the European Union.